LANSING (JULY 11, 2018) — Days before Gov. Rick Snyder announced in November 2017 that “business as usual” was “not acceptable” from the company that owns an aging oil pipeline beneath the Straits of Mackinac, a state official went over a press release about upcoming reforms with the company’s lobbyist. The state’s press release was about an agreement the Snyder administration had reached with Enbridge Energy to require new safeguards for the pipeline. The lobbyist who got a preview of the document, Deborah Muchmore, is married to Snyder’s former chief of staff, Dennis Muchmore. She and another lobbyist for Enbridge Energy also were given a draft of the state’s internal talking points about the deal. 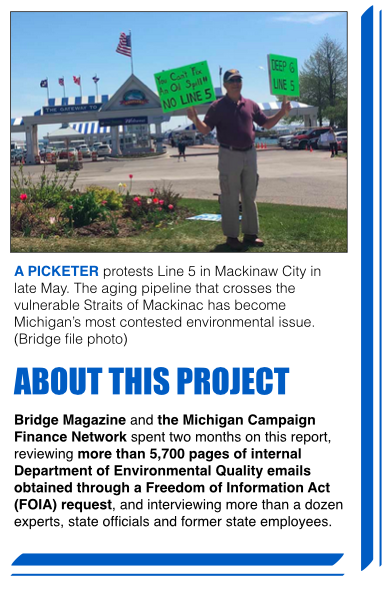 “I have been asked not to share the press release until we get feedback from the boss, but (I) went over it with Deb so she has the flavor,” Valerie Brader, then-director of the Michigan Agency for Energy, wrote in an email to Deborah Muchmore and an Enbridge official. 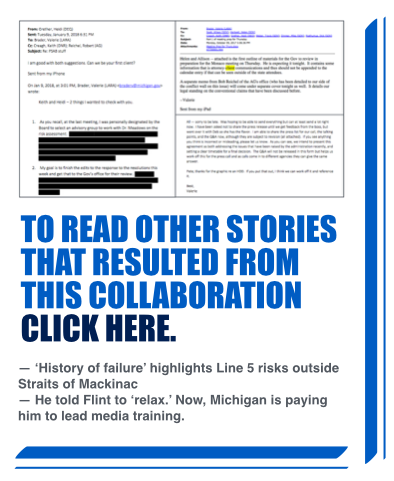 The email is one of several examples showing that Michigan leaders have allowed lobbyists and officials with direct relationships to Enbridge to offer extensive input about the fate of the pipeline, according to an investigation by Bridge Magazine and the Michigan Campaign Finance Network. The investigation was based in large part on a review of more than 5,700 documents, including public disclosures and internal emails obtained through the Freedom of Information Act. The findings come as Snyder approaches a self-imposed August deadline to decide whether to order Enbridge to replace parts of Line 5, which cuts across both Michigan peninsulas en route from Superior, Wisc., to Sarnia, Ont., and has drawn waves of environmental concerns, particularly along its lake bottom stretch in the Straits. — Brader, the former energy director and a former co-chair of the Pipeline Safety Advisory Board, resigned in January and became a registered lobbyist for a consulting firm advertising services to energy industry clients. The state hired Brader’s firm in April at a rate of $375 per hour to provide outside counsel on Line 5. — Another former advisory board member, Guy Meadows, led a team through Michigan Technological University that won a roughly $750,000 state contract to analyze risks regarding state pipelines – even though he had served as the lead on three research projects funded by Enbridge. — Meadows’ team won the contract because of conflict. A separate company had been doing the analysis, but the state canceled its contract because a staffer was working on another project for Enbridge. — Enbridge’s Michigan lobbying firm, Kandler Reed Khoury & Muchmore, not only employs the wife of Snyder’s former chief of staff but also a former communications director for the Department of Environmental Quality who resigned during the Flint water crisis. Another state agency hired the firm in February to provide media training. David Holtz, communications coordinator for Oil and Water Don't Mix, a coalition of groups opposed to the pipeline, said the coordination of the press release is a “smoking gun” that shows Snyder’s administration partnered with Enbridge in deciding Line 5’s fate. “Citizens are given a phony process …controlled by the oil industry along with a meaningless advisory board that is simply a distraction from what is going on behind the scenes,” he said. The advisory board didn’t work with the Snyder administration on the Enbridge agreement, and the coordination of the public messaging is a big concern, said Mike Shriberg, executive director of the National Wildlife Federation Great Lakes Regional Center and a member of the Pipeline Safety Advisory Board. “They are clearly looking out for the interests of Enbridge,” he said. But Shriberg said he gives the state “a pass” on some connections it’s allowed between those analyzing Line 5 and Enbridge. Interwoven relationships between state regulators and industry are common even if some are “on the edge of being improper,” said Michael Stifler, who spent much of his 36-year career at the DEQ leading water cleanups in the Cadillac district before retiring in 2010. Snyder’s administration says it treats Enbridge similar to others deeply interested in the matter. And the emails obtained through the FOIA never show Enbridge directly suggesting what actions the state should take. “The state has endeavored to keep Enbridge informed of significant public outreach, just as it has endeavored to keep other key individuals informed in the Legislature, members of Congress and tribal governments, said Scott Dean, a Department of Environmental Quality spokesman. Snyder announced additional safeguards after it was revealed last year that Line 5’s protective coating in the Straits of Mackinac was damaged in several places. The November deal required Enbridge to study alternatives to Line 5 to improve underwater monitoring in the Straits, swap a Line 5 segment beneath the St. Clair River for a tunnel-protected line and study ways to bolster safety at other water crossings. “Business as usual by Enbridge is not acceptable and we are going to ensure the highest level of environmental safety standards,” Snyder is quoted as saying in the press release. The deal, negotiated privately, was news to some Pipeline Safety Advisory Board members. Shriberg said he doesn’t think the board would have gone along with some of the measures in the agreement. However, the state gave Enbridge an early glimpse at its strategy for selling the deal to the public, agency emails show. The state shared its talking points, a question-and-answer document and a list of media members on a press call, emails show. “If you see anything you think is incorrect or misleading, please let us know,” Brader, the energy director, wrote to the lobbyist Muchmore on Nov. 25. Sending a press release ahead of time to an affected company is not unusual, according to former DEQ employees who served in past administrations. But Robert McCann, a spokesman for the DEQ under former Gov. Jennifer Granholm, said he doesn’t remember providing a company with the state’s talking points. And Brader’s solicitation of feedback on anything “misleading” also caught McCann’s attention. “I don’t think giving anyone a heads up is inappropriate,” said McCann, who is now a political consultant who works with Democrats. The emails don’t indicate whether Enbridge’s representatives suggested any changes to the talking points or the press release. 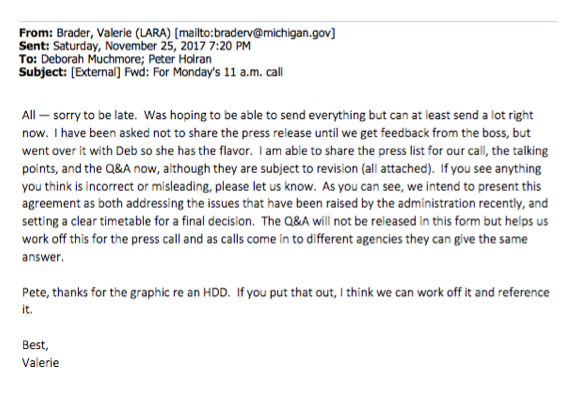 Dean, the DEQ spokesman, described the coordination as a way for Michigan and Enbridge to keep each other informed. Brader left the state in February, but before she did, she chimed in on an email exchange about Line 5-related strategies with DEQ’s Grether, Department of Natural Resources Director Keith Creagh and Assistant Attorney General Robert Reichel. The email is heavily redacted by DEQ lawyers, but it includes a prophetic exchange between Grether and Brader. “Can we be your first client?” Grether asked on Jan. 9, the same day Snyder announced Brader was leaving the Agency for Energy to lead a private energy consulting firm. The question was a joke, a DEQ spokesman confirmed. But Brader would be back to work for the state soon enough. Grether and Brader had been two of Michigan’s top officials working on Line 5. Before leading the Agency for Energy, Brader served Snyder as a policy adviser. Grether became DEQ director in 2016 following a career as an oil industry lobbyist and executive who spearheaded BP’s public response to the Deepwater Horizon explosion. Asked in June if she has taken any clients involved in the Line 5 debate, Brader identified one: Snyder’s office. Rivenoak signed a contract in April in which Michigan will pay $375 per hour for legal counsel, confirmed Anna Heaton, a Snyder spokeswoman. The contract is on an as-needed basis, so it’s not clear how many hours Brader will work for the state. “Ms. Brader has immense expertise on energy matters and so was retained to provide counsel to the administration after she left public service,” Heaton wrote in an email. Brader isn’t the only former state official who worked on environmental issues to later return. Brad Wurfel, a former DEQ spokesman, who resigned in December 2015 amid the fallout from the Flint water crisis is one of two “key personnel” training state and public health officials as part of a $49,000, three-year contract with Lansing lobbying firm, Kandler Reed Khoury & Muchmore. The firm, which also represents Enbridge, was selected after the state twice sought bids – and was the only one that met a “technical portion” of the project criteria, said Jennifer Holton, a spokesman for the Michigan Department of Agriculture and Rural Development. Deborah Muchmore is Wurfel’s partner in the health official trainings. Richard Hall, a professor of public policy at the University of Michigan who studies lobbying, said the “general worry about revolving door lobbyists” and consultants is they are always looking for their next client while working in government. In the Line 5 debate, though, “it’s more difficult to sort out the ethics,” Hall said. “Individuals in the Republican government are there in part because they’re more sympathetic to industry. That’s what their boss believes in,” he said. Michigan officials have said they’ve taken steps to reduce conflicts of interest in decisions involving Line 5. The most aggressive move came in June 2017 when Snyder’s administration announced it had terminated a contract with a firm the state paid to analyze Line 5’s risks. An employee for Det Norske Veritas, Inc., had worked on another project with Enbridge while the firm was studying the pipeline for the state, violating a conflict of interest clause in its contract. According to internal agency emails, Det Norske self-reported the issue nearly a month earlier. Bjorn Nilberg, the firm’s senior principal consultant, first reported the “potential Line 5 conflict” on April 23, emails show, and followed up with more details over the next few weeks. He identified that one employee had simultaneously worked on an Enbridge project and state Line 5 project. If the state initially planned to forge ahead with the contract, it’s unclear what changed in the next few days. Nilberg said he couldn’t discuss his exchanges with state officials because the company considers “all of our projects to be confidential,” DEQ also declined to comment. After terminating Det Norske, the state tapped a team from Michigan Tech University to do the risk analysis study estimated to cost $750,000. Meadows, a professor at Michigan Tech and a member of the state’s pipeline safety board, drew up the proposal for the job. Snyder’s pipeline advisory board unanimously backed the proposal from Meadows, who directs Tech’s Great Lakes Research Center. Supporters included Shriberg, regional director of the National Wildlife Federation, which has called for a Line 5 shutdown. 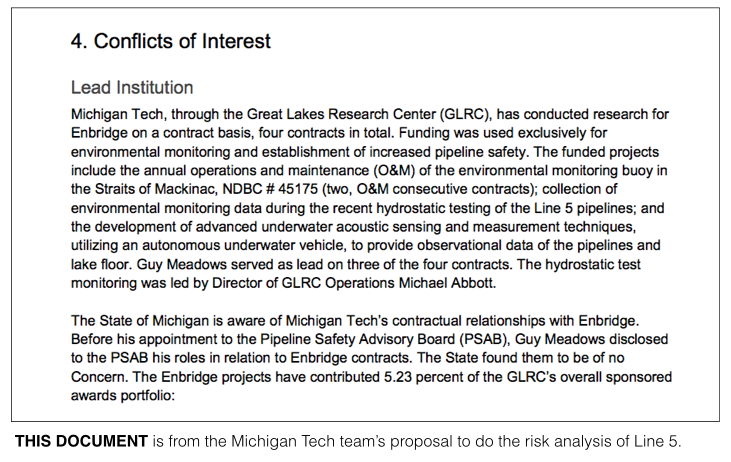 In its proposal, the Tech team disclosed under a section labeled “conflicts of interest,” that Michigan Tech had conducted research projects for Enbridge spanning four different contracts, with Meadows leading three of them. At the time, Meadows said he isn’t beholden to any company but acknowledged the relationship could look like a conflict. “That’s for the public to decide,” he told The Detroit News. Dean, the DEQ spokesman, said the agency didn’t see a conflict. Michigan Tech has yet to complete its analysis. Meanwhile, Enbridge this month released a report, required by its November 2017 agreement with the state, calling it “feasible” to replace Line 5’ Straits segment with a new line buried 350 feet below the lake surface in a tunnel that would “virtually eliminate any risk” of a spill. Snyder and Attorney General Bill Schuette, a Republican candidate for governor, have voiced support for the tunnel idea, which Enbridge said would take up to six years of planning and construction and cost up to $500 million. Environmentalists oppose the idea and have instead called for a complete Line 5 shutdown. Snyder is expected to announce in August whether Michigan will forge ahead on the tunnel idea or opt for something else.